Master werden ist nicht schwer, Master sein dagegen sehr! - ZineWiki - the history and culture of zines, independent media and the small press. Master werden ist nicht schwer, Master sein dagegen sehr! is one of the first publications by Astrid Toda. Astrid Toda is from Germany but lives in Benin, West Africa. She is an activist, writes, takes fotos but first and foremost she is organizing the construction of schools in remote villages in close collaboration with the local people. Subject-matter of this A5 publication is the dependency between employer and employee. On 36 pages she reports on her experiences and memories in the first years in Lagos, Nigeria (Westafrica). 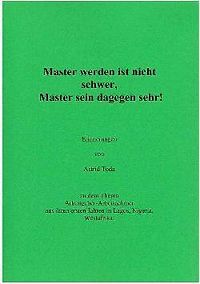 The title could be translated with: "It's easy to become a master, but it hard to act as one!" The zine is dedicated to her friends in Nigeria, especially to Julius an Festus. The publication is included in the collection of the St. Patrick's Zine Library. Her texts and publications support her aim for social improvement. Astrid Toda speaks several languages including German, English, French and Japanese, among others. Some of her publications are available in different languages. In some projects she collaborated with the German artist Patrick Rieve. In 2010 he worked on the layout for Guidebook for Benin, Westafrica (German title: Knigge für Benin); in 2012/2013 he did the nonverbal poster for the campaign: All Girls to School! This page was last modified on 10 February 2014, at 06:13.